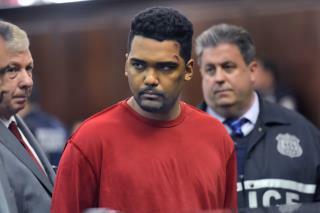 (Newser) – A man accused of mowing down pedestrians in Times Square, killing a teenage Michigan tourist and injuring 22 others, says he had been trying to get psychiatric help. In a jailhouse interview on Saturday, Richard Rojas told the New York Post that he recently spoke to a mental health counselor at a local veteran's center but they never got back to him. "I was trying to get help," Rojas told the newspaper from Rikers Island. "I wanted to fix my life. I wanted to get a job. Get a girlfriend." Rojas, who lived with his mother in the Bronx, drove his car Thursday through Times Square, then steered his car onto a sidewalk, plowing through tourists for three blocks before crashing into protective barriers. Another right wing nut goes crazy. This is an act of right wing terrorism. He couldn't find a place to park. Mr. Rojas will not qualify for health benefits with the VA because of his dishonorable discharge from the U.S. Navy. However, if his drinking that earned the dishonorable discharge can be attributed to military service, the veteran may receive some benefits following review. The process may be time consuming.